While the photo may not look like much, we could not be more proud of it. 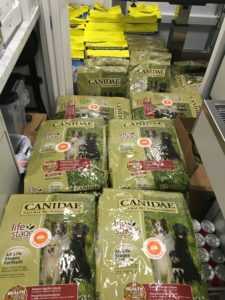 Because that’s part of the 2,000 pounds of food The Pongo Fund Emergency Kibble Response Team delivered today, 2,000 pounds of Canidae dog & cat food for furloughed TSA, FAA, and Customs and Border Patrol agents and employees. Nine of those furloughed employees stayed late at the end of their regular work shift and unloaded our truck. A work shift for which they earned no paycheck. We’ve got so many federal workers reaching out for help that we’ve already provided more than 10,000 pounds of extra food this month. And in case you don’t know it, that’s a huge amount of food. And that 10,000 pounds of food is on top of all of the other help we provide throughout our regular distribution network, which now includes 50 different satellite locations. That’s right. The Pongo Fund has 50 different satellite locations. Here’s the weird part. Those furloughed federal workers are fully employed. Asking for help is not their way. Yet their employment brings no paycheck. It’s a terribly confusing situation, both financially and emotionally. And they shared that with us, about how most of them don’t even know where to look for help. Plus they don’t have the time, as they are still working full schedules. And that’s what made today’s delivery extra special. Because they never saw it coming. We pulled up and got to work, 30 minutes later we were gone. And next week we’ll be doing it again, as we’ve got a waiting list of another six federal locations to deliver too. The thing is, we’re getting crushed by need, and that’s why we need your help. Because this Shutdown is hurting a lot of people. And those people have hungry pets. 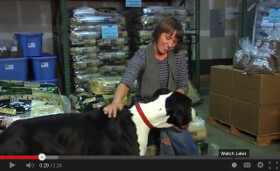 And all this extra help means our pet food bank is pretty much empty. And that’s why we’re getting crushed. Because so many need us. And that means we need you. Please, if you can, please donate to help us. Because we flat out can’t do it without you. Please click here to give: https://bit.ly/2oUZeYh.